Revolution will play English club Chelsea — but when? 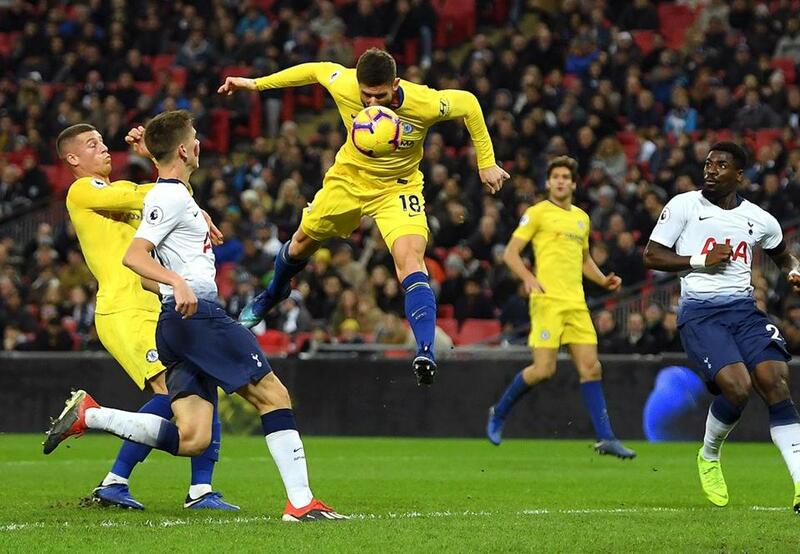 Chelsea FC of the English Premier League (in yellow) during a match against Tottenham this month. The Revolution’s charity match with Chelsea FC is a go. And it will be at Gillette Stadium. The difficult part will be wedging the game into the Blues’ busy schedule. Both the Revolution’s Robert Kraft and Chelsea chief investor Roman Abramovich have told team administrators to carry out the planning. Kraft announced the match during the World Jewish Congress at the Pierre Hotel earlier this month, but left out details. And those details are proving so complicated that there is little chance the game can be played until next summer. Chelsea has 24 dates remaining in the Premier League, plus games in three other competitions: Europa League, FA Cup, and League Cup. The Blues could be playing as many as 44 games from now through May 24. That’s about one match every four days. ■ and as quarterfinalists in the League Cup. Also, Chelsea will not be treating the match against the Revolution as an afterthought; coach Maurizio Sarri has been ordered to field a lineup of first-teamers. Abramovich has attempted to return Chelsea to prominence on the continental stage, spending 357.84 million pounds ($458 million) on transfers the last two years. After slipping to a 10th-place finish in 2015-16, Chelsea hired Antonio Conte, who guided the team to the Premier League title in 2017 and its eighth FA Cup title in 2018. This season, Sarri has led Chelsea (8-1-4, 28 points) to fourth place in the Premier. As part of Chelsea’s relaunch, several players departed, including Senegal national team defender Papy Djilobodji, since released by Sunderland and available to MLS teams, though he might have to agree to a salary reduction. Abramovich, who has committed Chelsea to several anti-Semitism initiatives, has not attended a game at Stamford Bridge since the British government did not renew his visa in May. He was denied Swiss citizenship but has been granted Israeli citizenship via the country’s Law of Return. This will be Chelsea’s third visit to the Boston area. The Blues lost, 3-1, to Eintracht Braunschweig in an exhibition at Manning Bowl in Lynn in 1967 and defeated Milan, 1-0, at Gillette in 2003. Atlanta United coach Tata Martino has displayed resourcefulness during the team’s advance in the MLS playoffs. Atlanta went from a five-defender setup in the second leg of the first-round series against New York City FC to a 3-5-1-1 alignment for a 3-0 win over the New York Red Bulls Sunday. A key to Atlanta’s flexibility is central defender Michael Parkhurst, whose anticipation, positioning, and instinctive play also enabled the Revolution to switch formations, from a 4-4-2 to a 3-5-2 during their run to three successive MLS Cup finals from 2005-07. Few MLS teams would place their central defender in a position to mark Bradley Wright-Phillips without plenty of cover — but that is what Atlanta did with Parkhurst. Atlanta’s back three against the Red Bulls also included Jeff Larentowicz, who gained his first professional experience with the Revolution. Larentowicz provided a cross to set up Josef Martinez for the first goal against the Red Bulls. Playing with three at the back allowed Atlanta’s Franco Escobar (who scored the second goal) and Greg Garza to relinquish defending responsibilities in favor of attacking on the wings. The absence of Red Bulls left back Kemar Lawrence (leg bruise), an MLS First XI selection, gave Atlanta another advantage on the outside. Former Providence forward Julian Gressel’s versatility has been another factor in enabling Martino to tweak tactics. Gressel, possibly the most effective right winger in the league this season, has taken on Larentowicz’s holding midfield role, and also is sparking the attack; he ran onto Miguel Almiron’s through ball and cut back at the end line for an assist on Escobar’s goal. Martino has been a step ahead, but the Red Bulls have a chance to try to catch up Thursday. Portland coach Giovanni Savarese’s strategy gambles failed to pay off as the Timbers were held to a 0-0 draw by Sporting Kansas City in the Western Conference playoffs. The Timbers needed to set an attacking tone in the home leg, but the team’s outside backs failed to get forward, and Jeremy Ebobisse was ineffective as a lone striker. The Timbers apparently hoped to create on the wings, but struggled against Sporting KC’s outside backs: Graham Zusi and former Revolution left back Seth Sinovic. Savarese, a former Revolution forward, will have to make bold moves when the Timbers visit SKC Thursday. Former Boston College defender Laura Georges has been named as the first female secretary general of the Federation Francais de Football. Georges, 34, recently retired after playing for Olympique Lyon, Paris-Saint Germain, and Bayern Munich and earning 73 caps for France’s national team. As FFF secretary general, Georges will be among the country’s primary representatives in dealings with FIFA and UEFA. France, the reigning World Cup champion, is preparing to play host to the 2019 Women’s World Cup. The first FFF secretary general was Henri Delauney, who helped originate the World Cup in 1930, the European Championship, and UEFA Champions Cup. Delauney worked with FIFA president Jules Rimet for decades and was the first general secretary of UEFA. Diego Maradona played his last international game during the 1994 World Cup at Foxboro Stadium. Both teams — Argentina and Nigeria — were composed of exceptional players, some of whom have gone on to coaching. The most successful has been Diego Simeone, who has guided Atletico Madrid to two Europa League titles and a La Liga championship. Surprisingly, Maradona himself might be the only other of those players experiencing success at the club level. Maradona has guided Dorados de Sinaloa to an 8-3-2 record since taking over as coach in September. Dorados eliminated Juarez (on goal difference, after losing, 1-0, on Sunday) in the Torneo Ascenso Apertura Liguilla, advancing in the promotion playoffs. The team’s central midfield leader is Fernando Arce, 21, who was among the youngest players on the US Under-20 team three years ago. Before taking over at Dorados, Maradona had been honorary president of Dinamo Brest in Belarus. He planned to bring Dorados goalkeeper Cristian Campestrini to Dinamo, but the deal was nixed, leaving Campestrini, 38, without a team. Maradona soon found an adequate goalkeeping replacement for Dorados in Gaspar Servio, a 26-year-old Argentinian. After Argentina defeated Nigeria, 2-1, on June 25, 1994, Maradona tested positive for ephedrine, which he claims was ingested via an over-the-counter dietary supplement, and received a 15-month suspension from FIFA. Boston University graduate Michael Emenalo played left back for Nigeria on that day, and has gone on to become sporting director at Chelsea and now AS Monaco in France’s Ligue 1.